This sassy salmon delivers with a spicy Mexican spin! 1 Drain jalapeños, cut in half, remove seeds and crush with the back of a knife to a fine paste. Halve 1 lime, squeeze the juice from half and zest the colored peel from the other half. 2 In a bowl, combine jalapeños with chili powder, brown sugar, 2 tablespoons oil and 2 tablespoons lime juice. 3 Rinse salmon fillets and pat dry, coat with marinade, cover and allow to marinate until ready to use. 4 Cut bell peppers into quarters, remove seeds, rinse and place skin-side up on a baking sheet. Roast under oven broiler until the skins are charred and blistered. 5 Place roasted bell peppers in a bowl, cover with a plate and set aside for 10 minutes. 6 Remove the skin and chop bell peppers finely. 7 Peel mango with a vegetable peeler. Cut into slices off the pit and add to diced bell peppers. 8 Peel and chop onion very finely. Rinse cilantro, shake dry and chop the leaves. 9 Combine bell pepper, mango, onion and cilantro in a bowl with remaining lime juice and 1/2 tablespoon oil. Season with salt, pepper and 1 pinch of sugar. 10 Add grated lime zest to sour cream, season with salt and pepper and stir until smooth. 11 Heat a grill pan and coat with reserved oil. Place marinated salmon fillets into hot pan. 12 Cook fish for 3-4 minutes on each side. Fill sour cream mixture into piping bag and decoratively pipe onto 4 serving plates. 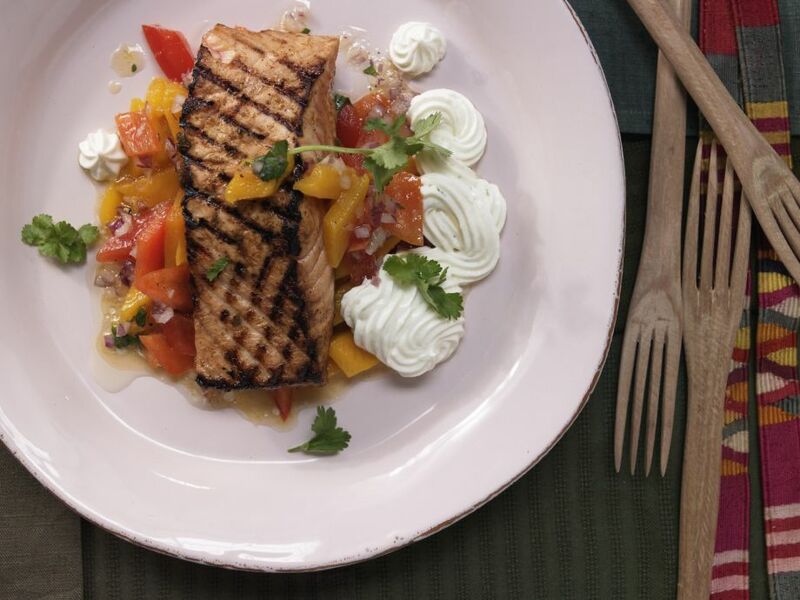 Add a serving of mango-pepper salad to each plate, place a salmon fillet on top and serve.